McCormick Grill Mates® Vegetable Seasoning is a veritable potpourri of spices, herbs and vegetables including onions, tomatoes, garlic, red bell peppers, sun-dried tomatoes, leeks and chives, that enhances the naturally delicious flavor of vegetables and vegetable dishes. Vegetable Seasoning is a great accent to any Mediterranean flavored dish. Sprinkle it on pizza or pasta, add Vegetable Seasoning to a veggie dip or use to simply season roasted potatoes. Just before grilling, toss vegetable chunks in vegetable oil, shake on Grill Mates Vegetable Seasoning and toss to mix. 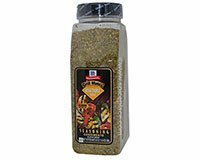 Grill Mates Vegetable Seasoning is also great used to shake-on at the table or when broiling,baking or stir-frying. Vegetable Seasoning works for more than just veggies and makes an ideal enhancement to more delicate meats, fish, poultry and eggs. For a quick side dish, toss Grill Mates Vegetable Seasoning with pasta and olive oil. Grill Mates Vegetable Seasoning also makes a great marinade for vegetables, meats, fish and poultry. Ingredients: Dehydrated Vegetables (Onion, Garlic, Red Bell Peppers, Sundried Tomato, Green Onion), Salt, Sugar, Spices and Herbs, Maltodextrin, Modified Corn Starch, Soybean Oil, Worcestershire Powder (Molasses, Vinegar, Corn Syrup, Salt, Caramel Color, Garlic, Sugar, Spices, Tamarind, Natural Flavor, Sulfiting Agents), Vinegar, Disodium Guanylate, Disodium Inosinate (Flavor Enhancers), Natural Flavors, Ascorbic Acid, Turmeric and Sulfiting Agents. Allergy Information: Contains Soy. Grill Mates Vegetable Seasoning is both Vegetarian and Kosher. Grill Mates® and McCormick® are registered trademarks of McCormick and Co, Hunt Valley, MD 21031.